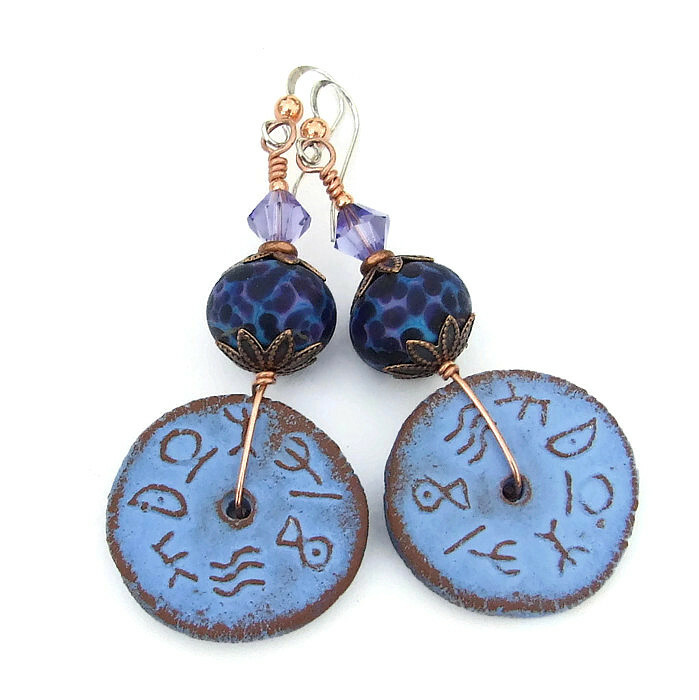 The rustic terracotta ceramic discs and speckled lampwork beads used as the focals of the DAWN OF TIME handmade earrings look as if they have spent eons lying in an ancient site, just waiting to be unearthed and worn again. 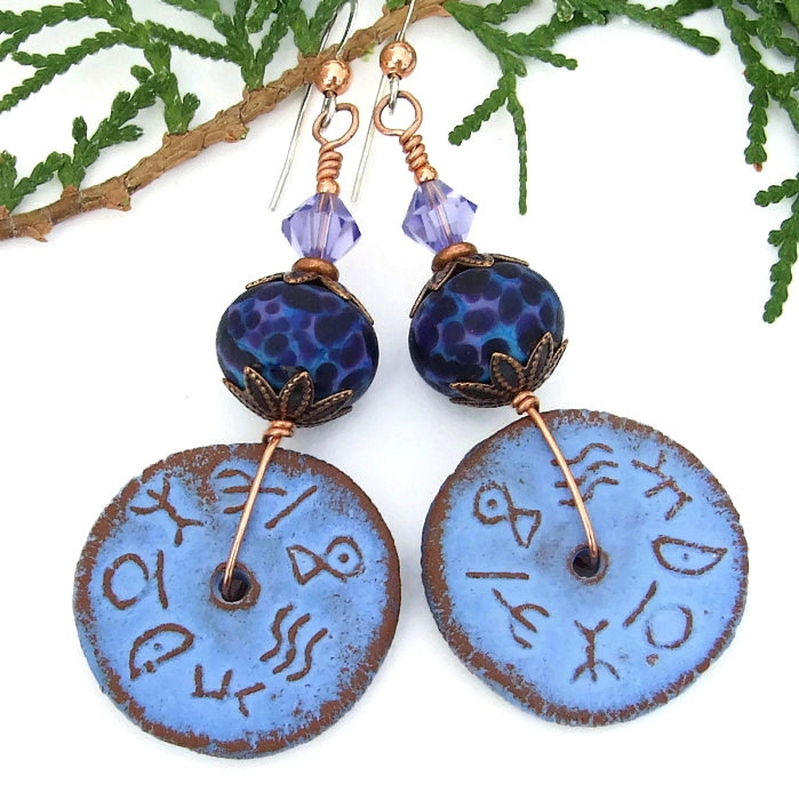 The not perfectly circular disc beads are individually artisan crafted by ceramic artist Nadia of NadiaTerra and feature seven individual rune symbols in a raised design on the front side. The back side has no runes and is slightly rounded. 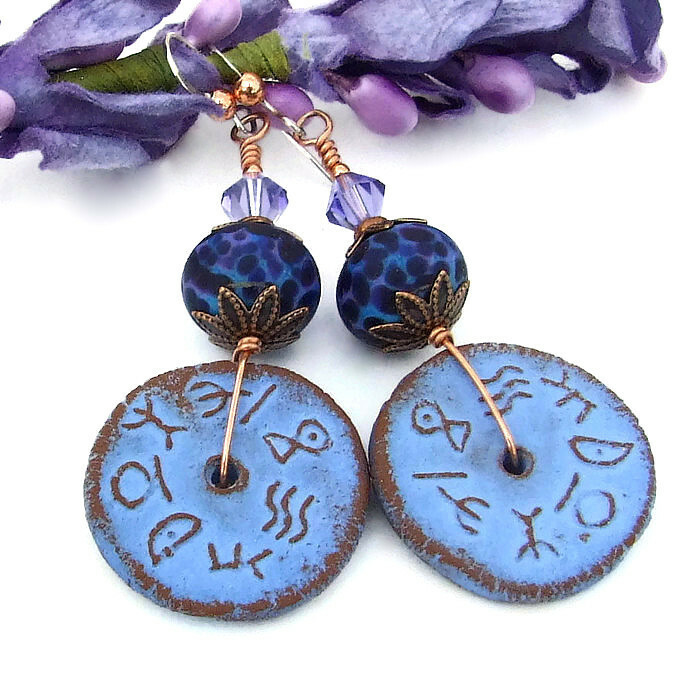 The rune discs were glazed with a lovely dusty blue color with just a hint of lavender. 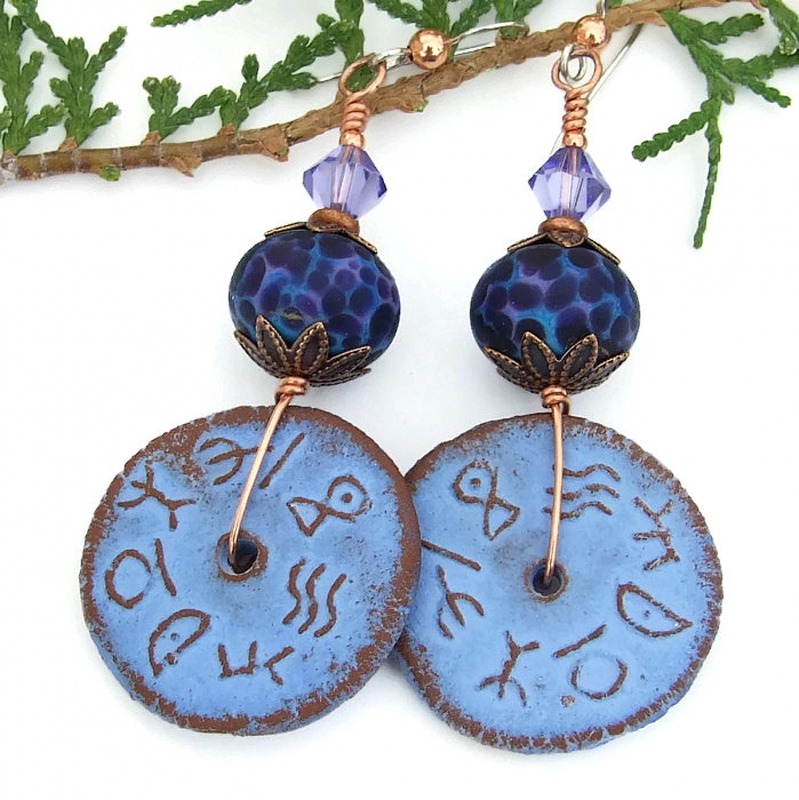 When fired, the raised rune designs and the edges shook off the glaze and were the designs were left in their natural terracotta color, a perfect complement against the dusty blue color. The finish is not shiny, but rather an old-looking matte finish. Highlighting the ceramic discs are rich lampwork glass rondelle beads by Lisa of artbylisi. The lampwork beads started out with a base of dark turquoise blue glass. Over that, violet purple glass was speckled - some of the specks are dark purple and some are lighter in color. 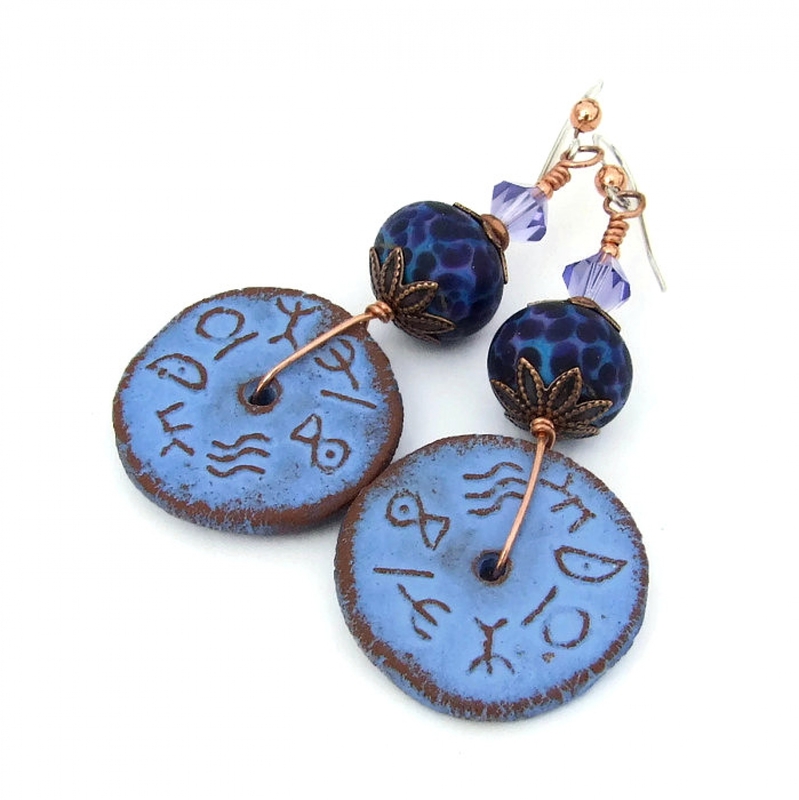 The glass beads have a velvety matte finish that plays perfectly with the rustic rune discs. A small copper spacer disc was added to the top of the lampwork beads with a luscious “tanzanite” purple Swarovski crystal adding great sparkle. Everything was carefully wire wrapped on copper wire and connected to sterling silver French hook earwires, each with a copper bead adornment. 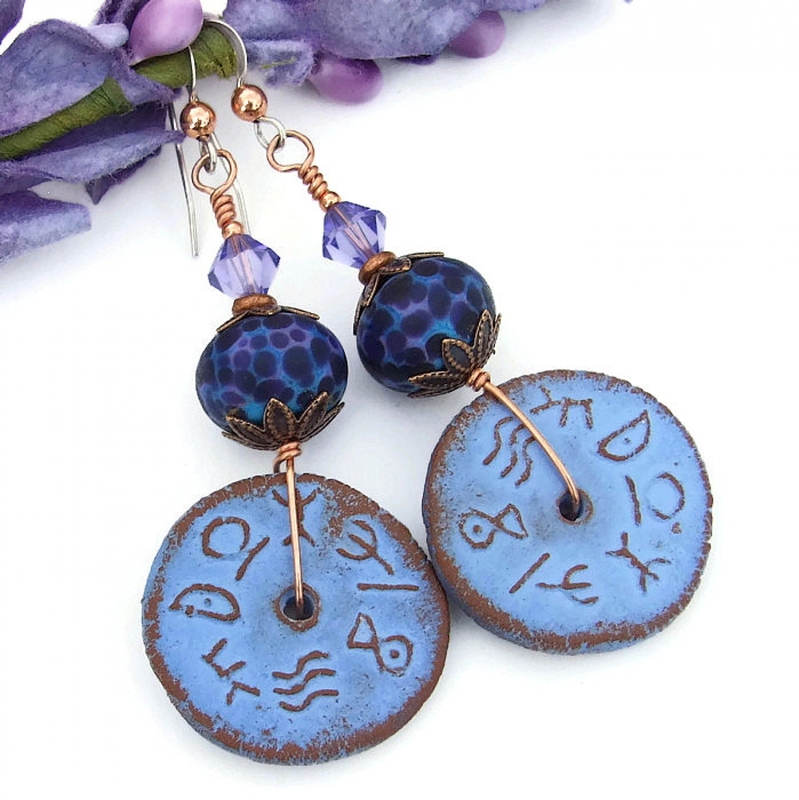 The unique DAWN OF TIME earrings were carefully designed and handmade by Catherine of Shadow Dog Designs for the woman who appreciates one of a kind, artisan jewelry. 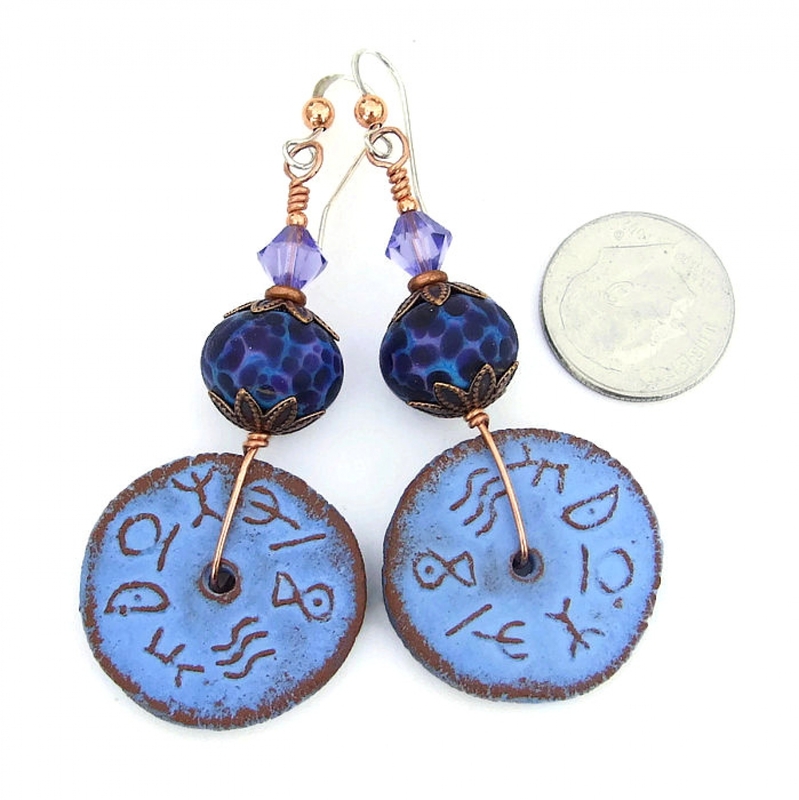 ​For a better understanding of the relative size of the DAWN OF TIME handmade ceramic rune discs and lampwork earrings, please be sure to check out photo #6 for a size comparison with a dime. Ceramic is said to help with positive decision making. Even though man made, glass and crystals carry the energies of transformation, rebirth and communication. Copper is said to allow the wearer to recognize barriers in the path of personal development. Silver is a metal of love and healing; it is a mirror to the soul, helping us to see ourselves as others see us. 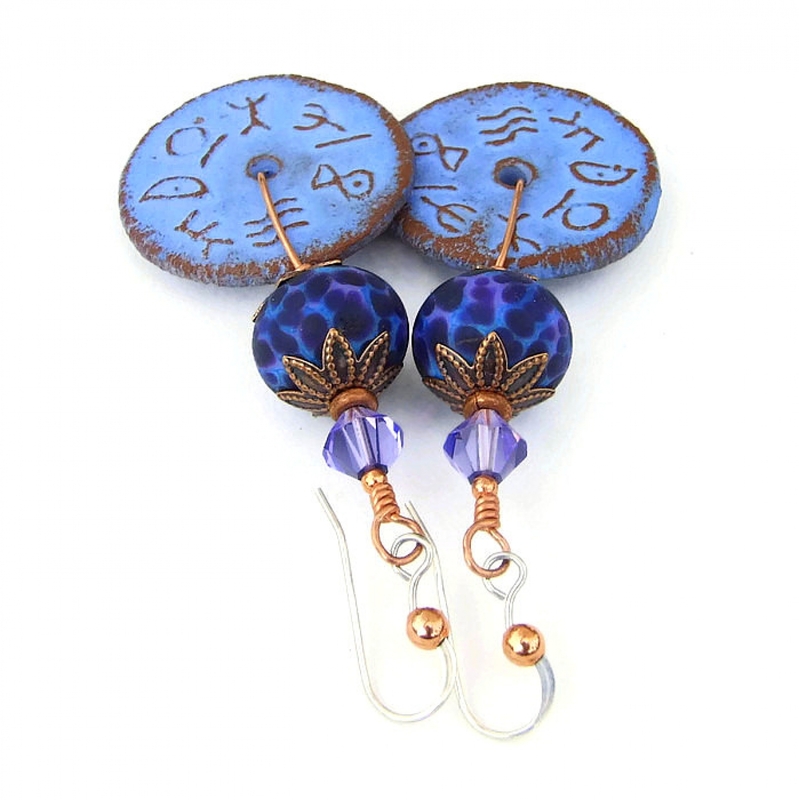 The DAWN OF TIME artisan earrings were carefully designed and handmade in a dog friendly, smoke free studio. They will be carefully packed in an organza jewelry bag with tissue, perfect for gift giving to a loved one . . . or to yourself! ***Please be aware that not all monitors show colors exactly the same. The colors of the items used to create my jewelry are extremely close to the actual color on my monitor. The colors may appear lighter or darker on your monitor.